Following our diagram of floating stones installation (Shetland Islands) we decided to make other sculptural installations directly in the sea – the first version will be in Loch Fyne, Argyll. As we are researching coastal plastic pollution, this work will connect found plastic debris with stones typical of the area. 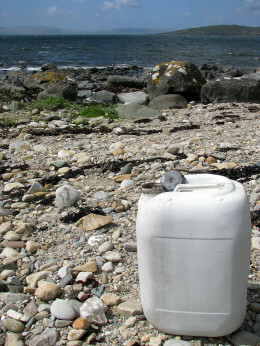 The plastic will be arranged in the sea like the prehistoric cup- and ringmarks unique to the Kilmartin Glen area. The stones will be suspended to the plastic debris rings and float in the seawater. The rings made out of plastic debris be seen from land. The other part – the floating ring of stones will be visible for divers. The stone circle will hang in a distance below the plastic underwater.